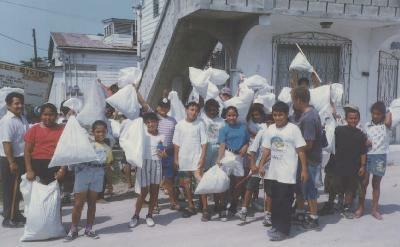 Over 500 students from the San Pedro Roman Catholic Primary School participated in the Friday, May 2, 1997 clean-up of downtown San Pedro. The clean up was sponsored by the San Pedro Town Board. The board provided trash bags and is also donating pens, pencils and exercise books to the students who particpated. "We want to do this on a periodic basis," said Town Councilor Eiden Salazar.